Flip will be performing in the inaugural Sydney season of TWISTED BROADWAY. Monday July 2, Parade Theatre - 8pm. Following the acclaimed success of its 2010 and 2011 seasons, Twisted Broadway is fast creating a name for itself as Australia’s most unique performing arts charity fundraiser. Featuring Australia’s premiere performers singing songs originally written for the opposite gender, Twisted Broadway re-imagines contemporary and classic music theatre numbers in this one night only performance. Modeled on the now six-year success of New York’s ‘Broadway Backwards’, an annual charity every raising money for Broadway Cares/Equity Fights AIDS; Twisted Broadway will continue to raise money for research and developmental programs for people living with HIV/AIDS through Oz Showbiz Cares/Equity Fights AIDS. Over 50% of those living with HIV/AIDS in Australia live under the poverty line.On average, 20 people are diagnosed with HIV every week in Australia. Twisted Broadway remains a strong voice for the ever-present support and commitment by the Australian Music Theatre Industry. I'm so excited to finally be sharing my theatre album with you. We've been working really hard on this and can't wait for you to hear it. The first single will drop as a teaser to the whole album, soon. What I'll do while we're still working, is have featured bits as a sneak peek into the recording process with my awesome gospel choir and my amazing band, SSJ. Obviously, I'm singing on the whole album, but I want to showcase my amazing friends in these behind the scenes videos. Sneak peek #1: My dear friend & drummer Dcd Cabrera. He's a beast. Until the next one, thanks for watching and I can't wait to show you more. 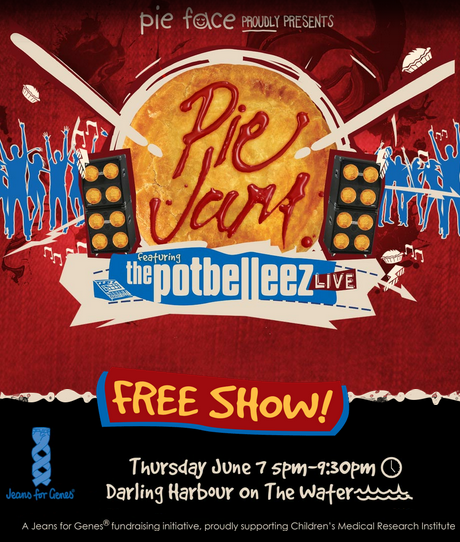 The Australian iconic electronic act, the Potbelleez, are headlining Pie Jam for Genes. I'll be performing with Adam Katz, as support. Pie Jam for Genes is a Jeans for Genes™ fundraising initiative, proudly supporting Children’s Medical Research Institute. Patrons will be asked to make a gold coin donation. Every dollar raised will help build the cornerstones for tomorrow’s cures and treatments for the benefit of children everywhere. Flip & Kuki had Laura Bunting from The Voice Australia into their studio.